Check out her first column of 2013 here, plus read her take from 2012 season when Missouri and Texas A & M joined the Southeastern Conference. We’re sure glad she’s on our team. Welcome to the SEC, boys. This Saturday will mark a new era when the Missouri Tigers and Texas A & M Aggies get their first taste of SEC football as members of the nation’s top conference. Hey – six national championships in a row don’t lie. This is no cupcake beginning, though: Missouri will face a powerful, No. 6-ranked Georgia while the Aggies will square off against the the No. 24 Florida Gators, who struggled last year but can still tout a long list of national accomplishments. Both of the SEC anchors will be traveling to the new kids on the block’s stadiums, so the Aggies and Tigers can take some comfort in playing on their home fields. Texas A&M was the first to hop on the SEC bandwagon this year. Their entrance marked the first addition to the conference since South Carolina and Arkansas joined in 1991, over 20 years ago. Missouri finalized its deal on July 1. As we all know, playing in the SEC is a marathon, not a sprint. A non-SEC team can often hang in a single game against the boys from the South and sometimes even provide a downright beating (see the Georgia-Boise State mess last year). But when you’re playing an SEC schedule all year, it’s a whole other ballgame. Many teams play only one or two tough games a year then enjoy the spoils of playing against mediocre or even just plain bad teams for the rest of the year. But if you go from that to playing back-to-back SEC teams every week (Tennessee then Georgia then Florida then South Carolina, or Alabama then Auburn then LSU then Arkansas) you’re going to have a whole lot of aching bones on Sunday. Heck, even the worst teams in the SEC can hold their own, leaving no one playing an SEC schedule time to breathe. Personally, I think Texas A&M and Missouri will do well in the SEC and I’m glad they joined. But you know from watching any reality competition show that the newbies are usually bullied then eventually worn down by the veteran players unless they just outright beat the vets, over and over. Georgia and Florida will both have their hands full this weekend, no doubt. But I’ll hold off on judging the Tigers and Aggies until January, no matter what happens on Saturday. 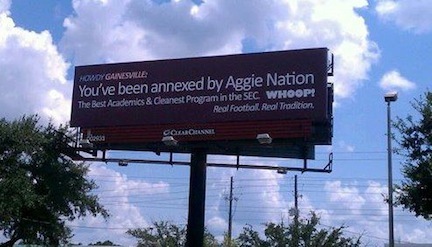 And you’ll see that the Aggies posted this billboard in Gainesville for a day to rile up the Aggie nation (and undoubtedly piss off the Gator nation). I guess building swagger before a big season is better than coming in with your tail tucked between your legs, and I actually think all of the preseason trash talk has been pretty funny. Stuff like that gets both teams fired up. But who will be laughing in the end? OLD MAN FOOTBALL!!!!! All-American Jarvis Jones!!!! Go Dawgs!!!! !